We are specialist advisers on ownership succession planning, the acquisition and disposal of businesses, and corporate co-operations. Our clients are business people and companies across all sectors of the economy, both domestic and foreign. 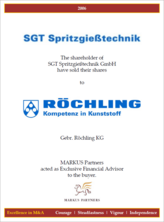 MARKUS PARTNERS was established on 1 January 2005 by Rolf Köchling and Bernhard Rittel as a partnership. 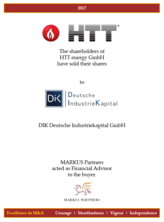 In October 2015, Daniel Kral became Partner of the company. In September 2016, Rolf Köchling retired by reasons of age. 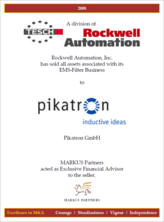 As a co-founder he remains in amicable contact with the company. 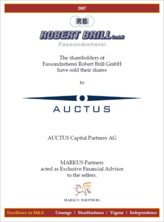 The active partners are the only shareholders. 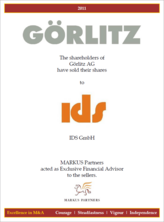 Together we look back to several decades of accumulated experience in M&A and private equity. During the course of our professional lives, we have initiated, managed and brought to a conclusion many transactions, both domestic and cross-border. A qualified team supports the partners. We have a partnership network covering all the significant industrialised countries. 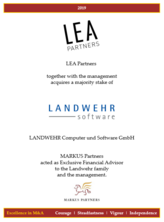 We are member of Vereinigung Deutscher M&A-Berater (VMA) - the German association of M&A advisory firms. 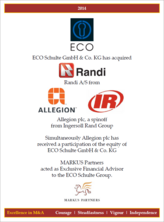 Each project is personally managed by a shareholding partner – Each client has a partner as a constant point of contact. We enjoy our work and give it our complete personal commitment. We form a team with our client; and as a team we discuss and settle all necessary and important steps. Only the interests of the client determine the selection of potential acquirers and vendors as well as co-operative partners. We keep the names of our clients, their projects and their plans confidential. 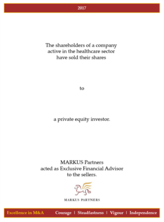 The only shareholders of MARKUS PARTNERS are the active partners. We are independent of any bank or other third party. 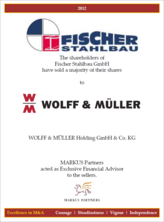 This freedom from conflicts of interests enables us to give our clients totally objective advice. Moreover, we only accept tasks that we are competent to handle. After graduating in Economics Bernhard Rittel began his professional career at the Bankhaus Lampe in Düsseldorf in 1990. Starting in 1991, he made a major contribution towards building up the bank’s corporate finance business which consisted of consultancy mandates, share issues and specialised corporate funding. 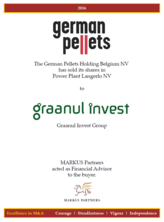 As managing director of Lampe’s private equity company, from its beginning in 1995, he was responsible for building up its investment portfolio. 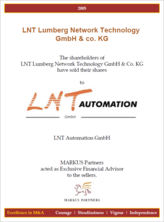 He became managing director when Lampe Corporate Finance was established in 1998, and was responsible for the acquisition of Krüger & Uhen. 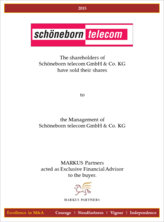 In 2002, he joined Rolf Köchling as a Managing Partner of Krüger & Uhen. 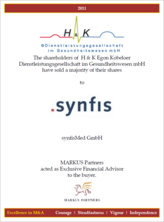 On 1 January 2005, Rolf Köchling and Bernhard Rittel founded MARKUS PARTNERS. Since then, they managed the company jointly. 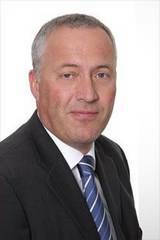 Bernhard Rittel has long experience in M&A consultancy and private equity investments. He has also managed stock exchange and structured finance transactions. After studying Business Administration at the University of Erlangen-Nuremberg and the Turku Business School, Finland, Daniel Kral started his professional career in 2003 in the M&A and corporate finance department of Dresdner Kleinwort Wasserstein. 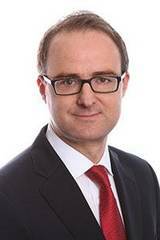 Following another M&A-occupation at Rothschild Frankfurt, where he accompanied especially transactions for financial investors, he has been working as an independent Investment Manager for several years and was Director at Silvia Quandt & Cie. AG. Daniel Kral supports the team of MARKUS Partners since spring 2013 as a Senior Consultant and became Partner on 1st October 2015. 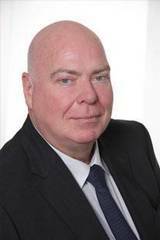 He has extensive experience in M&A and Capital Market Advisory (ECM & DCM) and successfully accompanied numerous of national and international transactions. courage, steadfastness, vigour and independence. These attributes give us guidance for our advisory business. 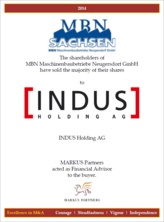 This is why we have chosen the name MARKUS PARTNERS and the winged lion as our logo. The mandate is tailored exactly to the needs of the client. Our compensation is based on time spent as well as the conclusion of a transaction. As experienced consultants, we strive to achieve the best solution for our clients in everything we do. Securing succession for the proprietor of a business is a task that requires experience and professional strategic preparation. The interests of the owner and his family have to be brought into harmony with the development potential of the company, the interests of the employees and the community of relevant business relationships. Due to its complexity and consequences, planning ownership succession requires careful project management. It therefore makes sense to engage an independent specialist for this task. We support the owner in carrying out what is arguably a very important personal and business task. We greatly respect the life-time achievement of successful proprietors and the responsibilities they carry, often for decades. As self-employed partners, we are consciously and explicitly identifying ourselves with entrepreneurial values and thus we can say that our advice comes from one entrepreneur to another. Experience, independence and entrepreneurial motivation are the key qualifications we bring to our advisory activity to achieve optimal solutions. Transferring a business into someone else's hands is a particularly challenging task which requires experience and comprehensive project management. It should always be carried out according to plan and professionally. Entrepreneurs can secure management succession by selling their business. Large corporations’ strategic goals may be to concentrate on their core business, or to secure additional financial resources for other investments, or to exit from markets where they cannot reach the position they aspire to. 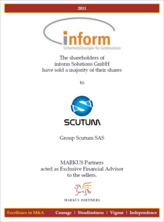 Financial investors effect disposals to fulfil their scheduled exit strategy. Owners can only sell their business once. So it makes sense to entrust this task to the best qualified adviser. A good adviser pays for his fees many times over. Our experience covers the different procedures used for the disposal of businesses both nationally and internationally including controlled auctions and we are able to apply them accordingly. Entering the German or European market, extending the product range, opening up new distribution channels and taking on new technologies, reducing production costs and much more. It often makes sense to strengthen a business and make its future more secure by way of external growth, in other words, by making acquisitions, either at home or abroad in order to achieve time advantages and thus secure the future prosperous development. We dispose of long-lasting experience to associate with entrepreneurial businesses and corporations, both in Germany and international. 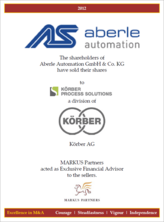 Due to the advancing globalization German Mittelstand companies, and large corporations may take the opportunity to enter into strategic alliances with other companies in order to meet the growing requirements in the markets.We advise our clients on all aspects of strategic co-operations, be it a question of geography, product, marketing/sales, or research and development features. 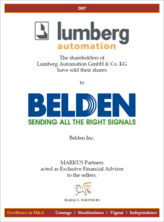 Member of Vereinigung Deutscher M&A-Berater (VMA), the trade association of professional mergers and acquisitions advisors in Germany. The contents of this website were carefully processed and are regulary checked and updated. 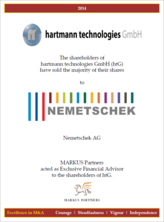 MARKUS PARTNERS do not accept any guarantees for the accuracy and completeness of the information provided. This site links to other sites. 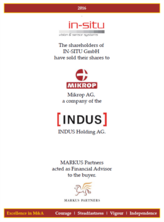 MARKUS PARTNERS have not verified these sites and are not responsible for the contents of these sites. 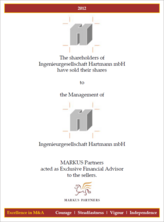 MARKUS PARTNERS reserves the right to change or amend the information provided on this website at any time. All trademarks or brands contained on this website respectively trademarks or brands protected by third parties are subject to the unrestrained regulation of the right of designation and the right of possession of the respective inscribed proprietor. 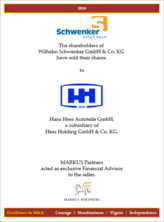 Contents and structure of the MARKUS PARTNERS website are protected by copyright. 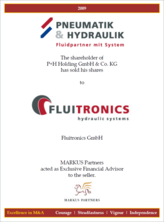 Duplication of information or data, especially the use of texts, text parts or graphical material recquires prior written approval by MARKUS Corporate Finance GmbH.